There aren't any truly terrible teams in the American League East this season. It's only July 18, of course, but this is a division that won't necessarily see any of its teams finish, say, 20 or 30 games under .500. As of today, the last-place team, Toronto, is a not-embarrassing 45-46, giving it the best record among the league's last-place teams, though Baltimore's terrible -57 run differential suggests they could have trouble hanging around the .500 mark. But here's the thing about the A.L. East: When the season began, multiple teams had reason to believe they'd compete for the division crown. Some 90 games in, though, and there are some pretty mediocre records in the East: The second-place Rays are tied for a wild-card spot, but they struggle to score runs and are just three games over .500. Just two games separate the second-place team from the last-place team, and even the Jays are only two games out of a playoff spot (even though they're in eighth place in the wild-card standings.) One might have thought coming into this season that there would be a logjam at the top of the East this year. Right now, though, the logjam involves everyone but the team at the top. The exception to those middling records, of course, is the Yankees' 56-34 mark. They've won four of five to open the second half and eight of ten overall. Their lead in the East has grown to nine-and-a-half games — more than twice the lead of any other division winner. (For what it's worth on July 18, the Baseball Prospectus odds report has them making the postseason 99.6 percent of the time, and more important in this era of one-game wild-card round, has them winning the division 96.8 percent of the time.) In a season in which there's a big incentive to finishing first in one's division, the Yankees are starting to pull away. 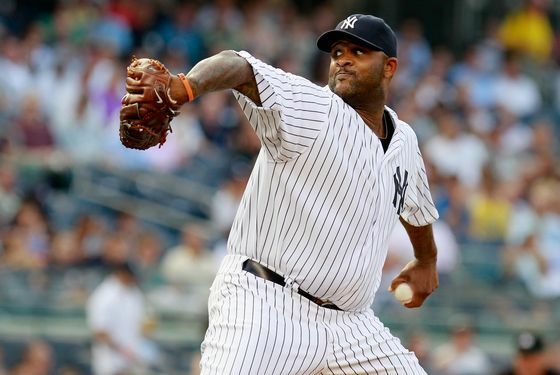 Last night, CC Sabathia returned from his stint on the disabled list and looked sharp, throwing six shutout innings. The Yankees cruised to a 6–1 win, and it was the 41st straight game in which they've scored at least three runs. (The last time they failed to do so? Way back on May 29, in a 5–1 loss to the Angels.) They'll go for a sweep of Toronto in a matinee beginning in a few minutes, and by the the night games start this evening, the Yankees could have a double-digit lead in the division. Hiroki Kuroda takes the ball foe the Yankees, against Ricky Romero.